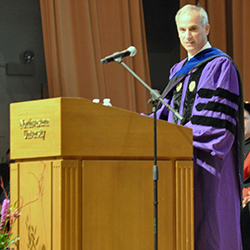 Northwestern University’s McCormick School of Engineering and Applied Science celebrated the graduation of its accomplished master’s and PhD students on Saturday, December 9. Held in the Technological Institute’s Ryan Auditorium, the commencement recognized 239 master’s students and 13 PhD students. The ceremony featured remarks by tech entrepreneur Rich Padula (’84), who founded Syclo and Deep Dish Technology. Padula emphasized the importance of building a positive workplace culture. He outlined three key attributes that contribute to a healthy culture: bringing the right attitude, being empathetic, and accepting failure. Padula ended by stressing the importance of doing the right thing, which adds to a culture of trust, respect, and teamwork. In parting, Ottino congratulated the graduates and urged them to stay in touch.